1st Sunday of March. Arzua, La Coruña, Galicia. A popular feast with many cheeses. In the evening, there are free concerts. Just before the spring equinox, everything negative left over from the cold days is burned in the blazing bonfires of the "fallas." This Fiesta dates from the Middle Ages, but it did not acquire the personality we know today until the middle of the last century. About March 12th the ninots (effigies), or Las Fallas, are brought out for display. The gigantic papier-mâché figures, with the exception of the most beautiful, will not be burned till the final days. Music is all around you in the pretty streets of Valencia. The spring fever, fires and fireworks create the same heightened atmosphere as that found at Carnaval time. The terms can be confusing. Las Fallas are the floats or giant figures. 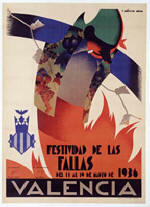 Fallas are the social clubs or committees that raise the money to build the floats. The young woman who represents the city during the festival is the Fallera Mayor. Everyone is invited to participate in the festival and the young men (Falleros) and young women( Falleras) dress in traditional suits and ornate gowns. The giant figures and scenes usually satirize culture, politics or the economy. At 2pm each day you should head for the city's main Plaza (Plaza Ayuntimiento), where the various districts of Valencia provide firework displays and compete to provide not only the best display but also the nosiest. Burning effigies are not the only speciality during Las Fallas. Another highlight is the daily mascleta, which takes place in the Plaza Ayuntamiento at 2pm, a mass of fireworks explosions, rockets and firecrackers. Feria del Caballo Horse Fair Jerez de la Frontera spanishpropertyworld. Shortly after Holy Week, the Seville Fair opens, brimming over with joy and spectacle. For more than a century, the April Fairs of Sevilla have offered visitors one of the most compelling community celebrations in the country, featuring parades of horses, circuses and Spain's most important bullfights. The party begins each year with the magical switching on of the lights It is time to enjoy dry sherry with friends, family and strangers, and to simply enjoy life. The highlights come at midday, during the long cavalcade of riders, and late at night when the spirit takes over the thousand throats of the "cantaores" (flamenco singers) and the legs and arms of the "bailaoras" (dancers) with their four sevillanas. The Real de la Feria blazes with multicolored tents, and wreaths and paper lanterns are outlined against the sky. Handsome couples ride beautiful horses, dressed in the Andalusian ruffles, country finery and broad-brimmed hats. The brilliantly decorated coaches with bells on their reins leave their marks in the white dusty paths. Seville and Andalucia are well known for bullfighting. One of the world's best known bullrings is open in the evening each night during the Fair. You are able to go along to the Plaza de Toros de Maestranza de Caballeria in central Seville and witness some of the world's top bull fighters in action. Now it's May and time for the nearby Corduba festival. This is a special day when Crosses of flowers are set up, in little altars, all around the picturesque village of Cieza. From the Asuncion Church, a building from the seventeenth century, comes a procession which circles the village around the altars. Every spring around one million people converge on the shrine of El Rocio, at the edge of the Doñana national park, in the biggest romeria, or pilgrimage, in Spain. For an emotion-packed three days, the devotees of the Virgen del Rocio - Our Lady of the Dew - take part in a celebration which combines religious fervor and festive color. The Wednesday before the Sunday of Pentecost, endless processions of swaying floats decorated with flowers come together in the small town of Rocío, 50km away from Seville. Many of the pilgrims make their way to the shrine on horseback or in brightly decorated carriages, multi-coloured caravans that wind across the Andalucian countryside. The pilgrimage attracts not only gypsies from the area but also caravans from all over Spain, as well as northern and central Europe. For the gypsies this long journey is a return to their nomadic roots. The Rocío also attracts fraternities from towns close to Cádiz, Huelva and Seville. The Virgen Del Rocio has been the patron saint of Almonte since the 15th century, when a hunter found a statue of the Virgin Mary in a tree trunk near the marshes. The devoted claim her intense powers can cure disease, infertility and mental disorders. Festival de los Patios Cordobeses/The Cordoba Patio Festival. This centuries-old festival includes the pilgrimage of the conquering Virgin of the Linares Sanctuary across the countryside with horsemen and richly decorated coaches, a competition of May Crosses and a Patio, Iron Grille and Balcony Contest in which the patios, small side street and plazas so typical of the city are filled with flowers. In the first days of the month, the May Crosses are put in place and adorned with flowers, flowerpots and embroidered silk shawls. On each is installed a counter offering food and drink to the visitors, who can also watch flamenco shows. After the Crosses comes the Patios Fiesta, when more than fifty patios are decorated with their best flowers to complete in beauty and originality. Find whitewashed walls covered with jasmines and honeysuckle, pots of geraniums, carnations and roses. Finally, there's the Nuestra Señora de la Salud Fair, with bull races, contests, theatre, flamenco singing, horses and everything the visitor can imagine to be enjoyed. The San Isidro festival is the most important bullfighting festivals in the world, but also offers other celebrations that include fairs, concerts, dances and the romeria, a kind of pilgrimage, to the ermita de San Isidro. San Isidro is the patron saint of the peasants and laborers, and is also the patron saint of Madrid. Tradition has it that on May 15th the people of Madrid are to make a Romería (pilgrimage) to San Isidro's meadow to celebrate his day and to drink from the miraculous water at the fountain of the hermitage. Legend has it that San Isidro was a poor peasant farmer, and he and his wife Santa María de la Cabeza were very popular due to their generosity and always donating food to the poor. So, although the tradition and background of San Isidro is religious and rather mellow, as per usual, it did not take much arm-twisting for the Spaniards to turn it into a veritable bash. 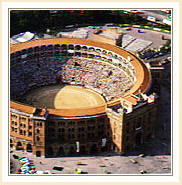 Bullfights in Madrid take place in the Las Ventas bullring, often referred to as the Mecca of bullfighting. The season in Madrid is from March to October, with bullfights at Las Ventas every Sunday at 7:00 PM. During the Feria de San Isidro, (from about mid-May to mid-June) and the Feria de Otoo (which begins toward the end of September) there are bullfights everyday, often with well known bullfighters. Tickets can be purchased at Las Ventas itself, with tickets going on sale two days before the bullfight. Tickets can also be bought at a small outlet (indicated as such in English) on calle Victoria. Many revelers still dress up in the traditional garb of the period, called "Chulapo or Chulapa," which is Madrid's national dress. Besides the Castizo dress on display you will find typical barquillos (rolled wafers), buñuelos (fritters) and rosquillas (doughnuts) are for sale. This time of year also ushers in the famous Feria Taurina, or bullfighting fair, which also carries the name of the patron saint of Madrid and lasts from the middle of May to the middle of June at the Plaza Monumental Las Ventas bullring. Concerts, open-air dances and outdoor celebrations are also held during this period. If you're not a bullfight fan, the heart of the festival is music, which is performed in locations throughout the city. San Isidro is without a doubt Madrid's most melodious fiesta. The main stage is always in the Plaza Mayor, and during every day and night of the 9-day festival, one can enjoy various concerts and traditional dancing. Most opening acts kick off with a "Hevia", a rather popular bagpipe and wind instrument player from Asturias. An even bigger venue is the Casa de Campo, which features rock concerts in the vast open parkland to the west of the city. Jazz lovers go to performances at the Colegio San Juan Evangelista, while children are also treated to an extensive program of events. Whitsuntide (Pentecostés) is the popular, English name for Pentecost, which is the Greek name for the Jewish Festival of Weeks which falls on the 50th day after Passover. The Holy Spirit descended on the Apostles on this day (see Acts 2:1) and the name Pentecost became applied to the Christian feast celebrating the event. Whit Sunday (el domingo de Pentecostés) is the 7th Sunday after Easter. It must always be between 10 May and 13 June. Whitsuntide is the days or even the week following Whit Sunday which include Whit Monday and Whit Tuesday. Trinity Sunday (domingo de Trinidad) The Sunday after Whit Sunday and hence the one before Corpus Christi. It always falls between 17 May and 20 June. The nun Juliana of Liege used to have a strange vision every time she began to pray, in which a full moon appeared with its center darkened by shadow. Finally, Jesus himself told her of the significance of the vision: the bright circle signified all liturgical celebrations and these were only darkened by the absence of a feast day dedicated to the exaltation of the actual presence of Christ in the Eucharist (which was debated at the time). Official recognition of the feast day was given in 1246. The new feast day arrived in Spain sometime during the 14th century. The feast date always shifts each year but is the day is always the Thursday following the eighth day of Whitsun. The feast of Corpus Christi in Cadiz involves a procession in which a Holy Host is enshrined in magnificent masterpieces of silverwork, and brought onto the narrow streets and alleyways surrounding the Cathedral to be paraded through wonderfully decorated streets. The event takes place during the celebrations of Corpus Christi, but has its prelude 50 days before the start of the festival. On this day the villagers act out the traditional demanding of the bull, the origin of which lies in the tale of how the son of the Benaventen Countess was killed by a bull. When she was told the news, the Countess asked as revenge that the bull was run to death in the streets by the villagers. From then on in memory of her son she donated a bull to the villagers on the same day every year. When the Countess died, the villagers ran to demand the bull from the mayor, and this tradition is now also repeated every year. On this day in the Plaza Mayor all the villagers clamor for a bull: "¡toro! ¡toro! ¡toro!" until the mayor concedes. The tradition is more than 300 years old, has been declared of national touristic interest in, and is one of the great attractions of the village of Benavente. The festival lasts a week. On the main day, which is on Wednesday, the young men of the village run the bull around the whole town. It is a physical race between the men and the bull, which has a rope tied to its horns so that it does not escape from the course.